Please join us with your family for the informative workshop on Islamic Manners conducted by Mufti Hussain Kamani at ISD. Mufti Kamani began his journey to pursue sacred Islamic knowledge began at age six. 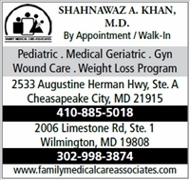 He currently resides in Chicago, IL with his family, where he has served as an Imam for 6 years. He also serves as an instructor for the Qalam Institute, where his class “Prophetic Code” has been studied by thousands. By the grace of Allah, he is the co-founder of KamaniOnline.com, a internationally recognized clothing brand for men’s designer wear. During his pastime he also enjoys jujitsu. 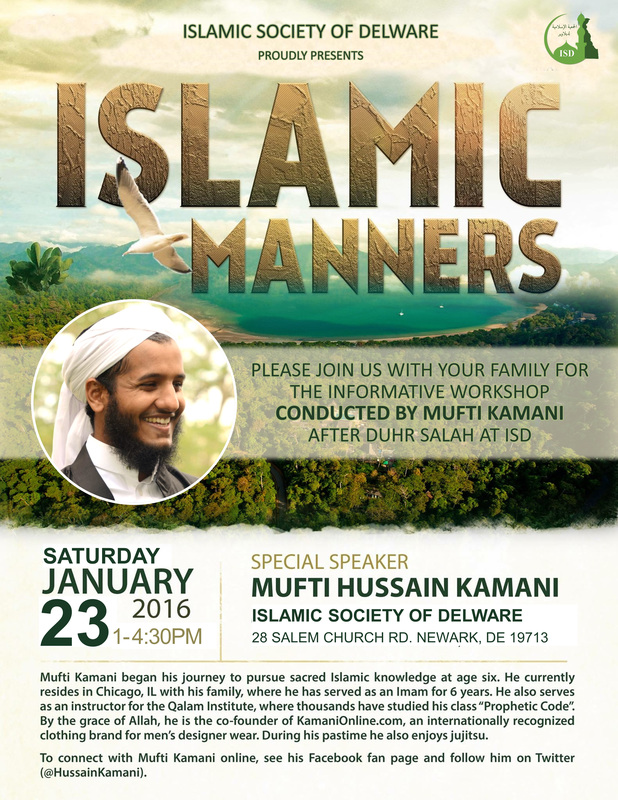 To connect with Mufti Kamani online, see his Facebook fan page and follow him on Twitter (@HussainKamani). 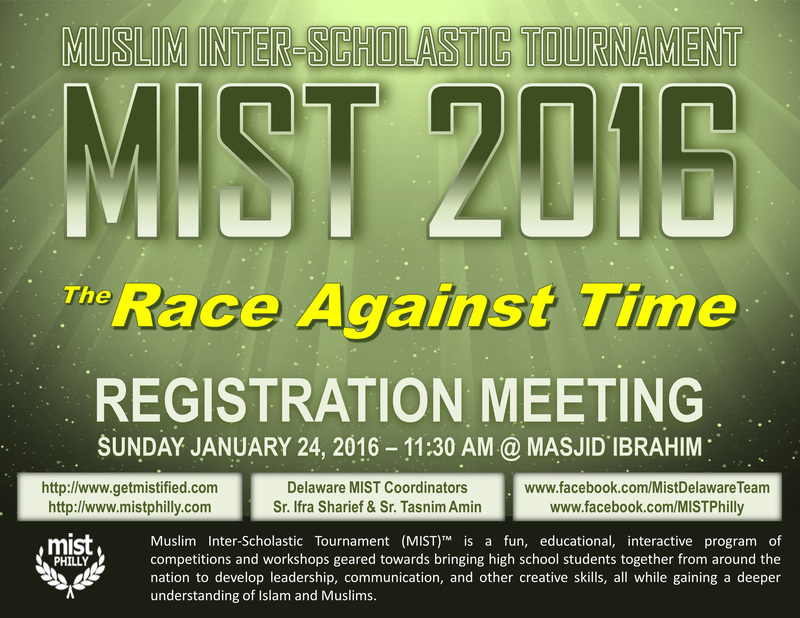 Bring your friends and encourage them to take part in MIST! The camp invites Muslim Boys and Girls of age 10 and above. strengthening of minds and bodies required for a Islamic Identity. During the break the participants will engage in sports and Karate session with Master Mohammed Hasan. Participants will also perform masjid cleanup. Attendees are expected to bring along Pen and notebook. There is no fee for attending. Sister participants will be under the supervision of Sis Nihal and Uzma. Interactive and hands on fun activities with Sister Mobina to keep your little ones busy. For ages 5 and up. Fun time includes Arts & crafts, Rhymes & rhythms, Story time and more…. Fundraising tickets are available for purchase at Masjid Ibrahim and IAD office. Tickets can also be purchased after both Friday Prayers. Please join the Fundraising Facebook Event and share among your friends and family. A rare opportunity for the Cricket enthusiasts to own a Cricket Bat personally signed by Shahid Afridi. The cricket bat will be auctioned during the ISD Fundraising Dinner and the highest bidder will be the lucky owner of the signed bat. Please note that ISD only has one signed bat to auction. Sheikh Suleiman will address the youth and the families followed by a Q&A session. Dinner will be served, please bring your friends and family and your favorite dish to share. We look forward to seeing everyone at this event Insha' Allah. For more Information please contact Br. Vaqar 302 588 9401.